So, I've been thinking about the purpose of higher education lately. (Students--especially at the ends of semesters--have a way of reminding us to think about this by believing that higher ed is about something else.) 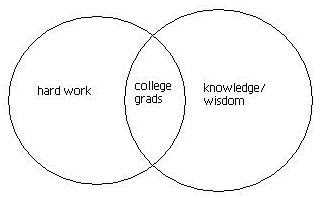 I came up with a Venn diagram to demonstrate what I believe: As you can see, college graduates exist in the union of hard work and wisdom/knowledge. Many undergrads think that they should be rewarded for hard work by itself. Wrong. Some gifted undergrads think that they should be rewarded for being smart. Wrong. Our jobs as educators should be to stimulate learning through hard work. Only then have we done our students a service. Think about what a college degree does. Primarily, it offers distinction, but not in the way that most might expect. Employers, contrary to popular opinion, do not require wouldbe employees to be fully trained professionals; rather, they want to know that they are hiring someone who is smart enough to learn the intricacies of a job and who has a strong work ethic. A college degree should be evidence to both of these. Our duty as educators is not to the employers but to the students. We owe it to them to prepare them for their futures.